And another series is completed! 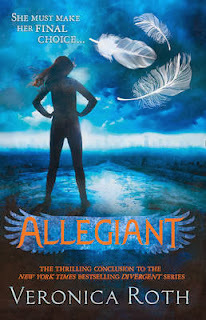 I have to say, even though I was never particularly attached to the Divergent trilogy or to its characters, I wanted to see how it would all end and how Veronica Roth would explain everything that had happened until now. Like I’ve mentioned in my previous review, I always felt that I didn’t know that much about Tris’ world; I needed to know why they were living in factions and what had happened before Chicago was divided. In Allegiant we are finally provided with an answer and, I have to admit, when I first read it I just felt like saying “Really? This is how you decide to explain this world and connect all the dots?!”. After so much time – and pages – invested in this story and in this mystery, I felt that the explanation given by Veronica Roth was a little weak and that it diminished – in some way – the relevance of dividing Chicago into factions. As for the characters, I liked Tris and Tobias’ story lines. Tris grew a lot during this book. She seemed a lot more focused on what was important and more determined to make a difference in her world. As for Tobias, I liked how vulnerable he seemed and that we got to see him deal with some unsettling discoveries. I also think that, as a couple, they matured a lot and were finally able to understand what being together truly meant. Finally, as for the plot and how the story progressed, I have to point out some of issues I had with it. First of all, I think it lacked some balance because there were moments when we had a lot going on but then, all of the sudden, the narrative would start to drag and loose the pace that had been set before. I also think that some of the deaths were unnecessary and I’m not saying that just because I liked some of those characters. It just felt like the author had grown tired of them and decided to kill them off because there was nothing left to do with them. They didn’t add all that much – if anything – to the story! Overall I give this book 3,5 stars. I think that, as a trilogy, it could have been told in fewer pages and that it could have delivered a lot more than it actually did. I think the story was overstretched and that there was a lot of stuff in the middle that wasn’t necessary and ended up seeming a bit pointless.